ABC Uppercase Alphabet Blocks by Uncle Goose. 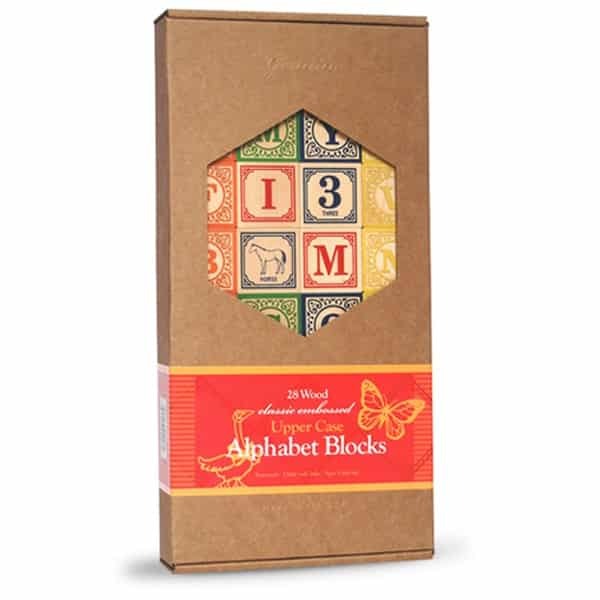 The standard ABC blocks are a generous 44mm (1.75”) (cubed and patterned after blocks from the turn-of-the-century, this set of 28 blocks is finely crafted and colorfully painted with non-toxic inks. Makes a perfect gift for the newborn baby to give to his/her older brother or sister. Each block features a unique animal picture, a number or math symbol, and four letters (two embossed) for a total of four complete alphabets. For ages 2 and up. Please note this set does not include the drawstring bag.